No one has to tell Bill and Amanda Leaseburg about difficult times. 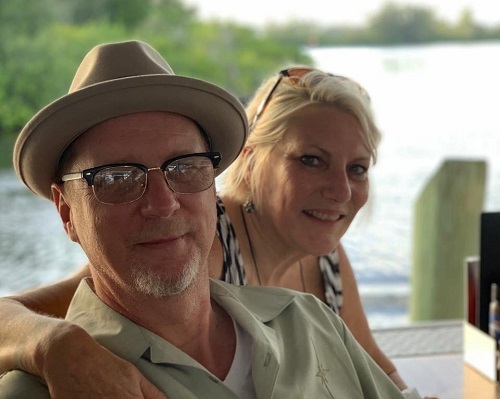 The couple are a small business owner and know all too well the struggles that come with getting far enough on your feet that you don’t have to worry about opening the mail to see what bill is due. It’s not unusual, particularly, in their line of work. In fact, it’s a part of the reason the name of their business is a legitimate double entendre. 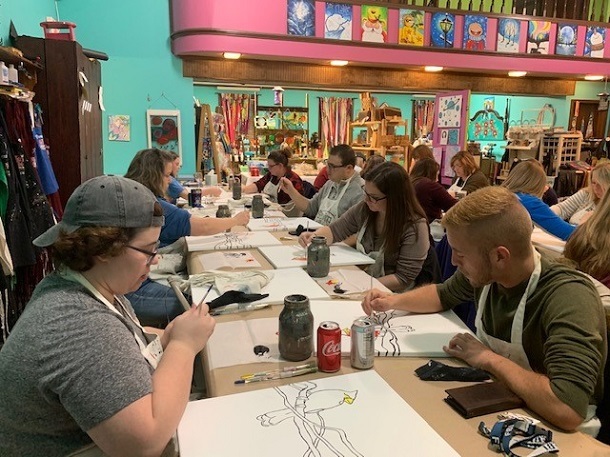 The term “Starving Artist” is one known by most in the art world and makes up a big part of the business name – “The Starving Artist Studio” – situated on 103 West Main Street. The sign leaves no doubt what the business is all about. It also play on the very real issues many trying to make a living in the world of art as they forfeit well-being on the material front to hone their craft. 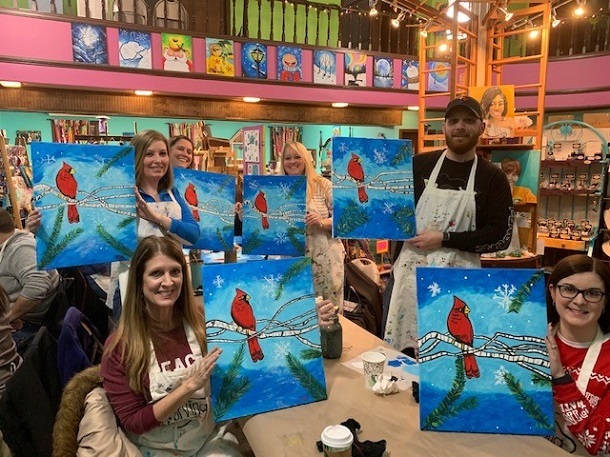 Because of that and where they’ve been since initially beginning their business in Clarksburg in 2012, Bill and Amanda Leaseburg have a soft spot for those that struggle or have the potential to do just that. With the federal government shutdown that has witnessed hundreds of thousands of workers furloughed, the Bill and Amanda didn’t stand idly by. If you know the Leaseburg’s and know of their own past explained above, the fact they knew a boatload of those workers live and work in our own area didn’t escape them. 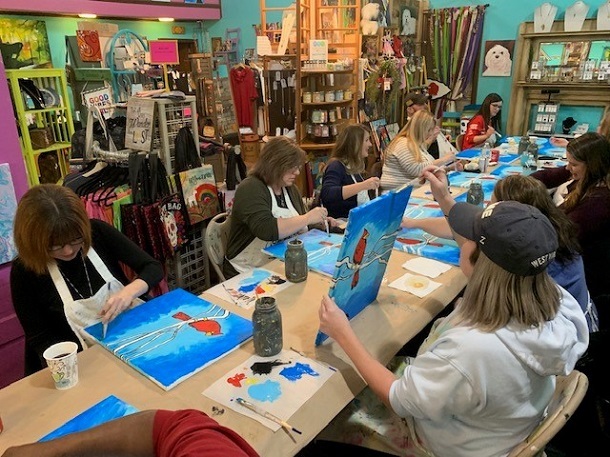 The idea is known as “Paint Therapy.” Better than the name is what it does – federal government workers can apply for various classes at The Starving Artist Studio that has been open since August of 2016 in Bridgeport for free. The idea for Paint Therapy was floated on the business Facebook page. The response, Bill said, has been overwhelming. On Monday, the first class was held. The first class was full. The first class was entirely government workers taking advantage of the good will of Bill and Amanda Leaseburg with the exception of two in the class. Right now, Bill said Paint Therapy classes are still available. Individuals need to go to their Web site (click HERE) for information. So how long will they last? It should be known that the Leaseburg family isn’t alone. My Little Cupcake is providing some of their tasty treats at classes and Bill and Amanda say private residents and others have agreed to donate refreshments for the classes. Frank Crislip of My Little Cupcake said it was easy to assist. In fact, he said it makes perfect sense to help out those who often help their own small business. Bill and Amanda said Bridgeport’s Riversong Spa is also looking to offer services to those impacted. You can visit their Web site too (click HERE) for contact information. WV Fitness 24 just across the city line on Tolley Drive in Clarksburg is offering free membership services during the work stoppage. Fairmont State University is having events today for workers. And I’m sure there are plenty of others I may have left out that can add their business information and what they’re offering in the comment section below. “Like most things, the huge forest fire starts from a spark,” Bill said. “The idea of what can we do have more people thinking, and some were already thinking, ‘how can we help.’ We aren’t singular anymore. We’re a group. Leaseburg said the work may not stop at the classwork level. He said the group that is coming together, if the work stoppage continues, may create a food bank. Bill added that legal individuals may be put together to discuss with those impacted how to work with mortgage or payments. “We hope none of that is needed, but if it is we want to be ready,” said Bill. That’s what good neighbors do. They help in a time of need. Bill and Amanda Leaseburg and everyone stepping up should be proud. I think I can safely say you’re good neighbors. 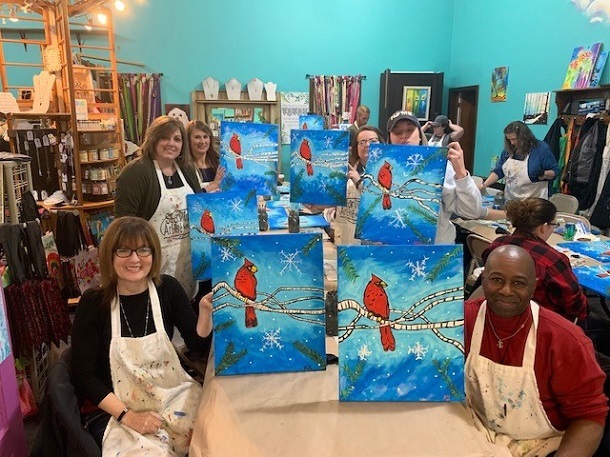 Editor's Note: Top four photos show the large crowd gathered at Monday's first "Paint Therapy Class" during work and with their completed projects. 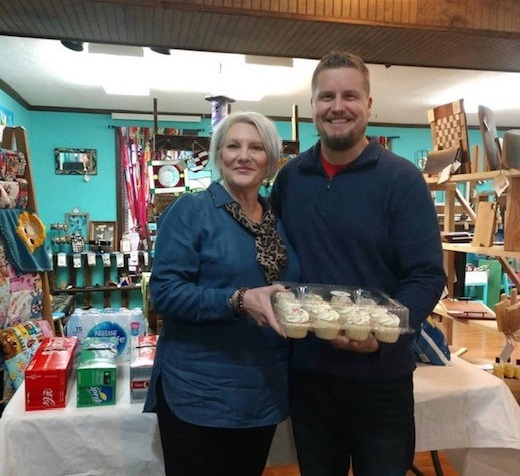 In the fifth photo, Amanda Leaseburg is shown with My Little Cupcake's Frank Crislip with some of the goods donated to the class, while Bill and Amanda Leaseburg are shown below. Photos courtesy of Bill and Amanda Leaseburg.